I am 19 years old, Kimberly Francis of St. Lucia. I am writing to let you know that I have completed memory verses cards from 1-20. My listeners were Euphemia Charles and Claudine D. Charles, both active members of the church. I'm also a Sunday School teacher at my place of worship; and from the time I started my verses, it helped ma a lot with my students and my personal life as well. I really fell this is the answer in finding victory in my youths of today's Christian life. It wasn't easy on my part to memorize my verses and to put it in practice in my every day life; but with God by my side, I was able to do it. Those who started before me, I know that the Lord have blessed their lives; and I only hope that I'm not the last but others may follow me whole-heartedly. God bless. 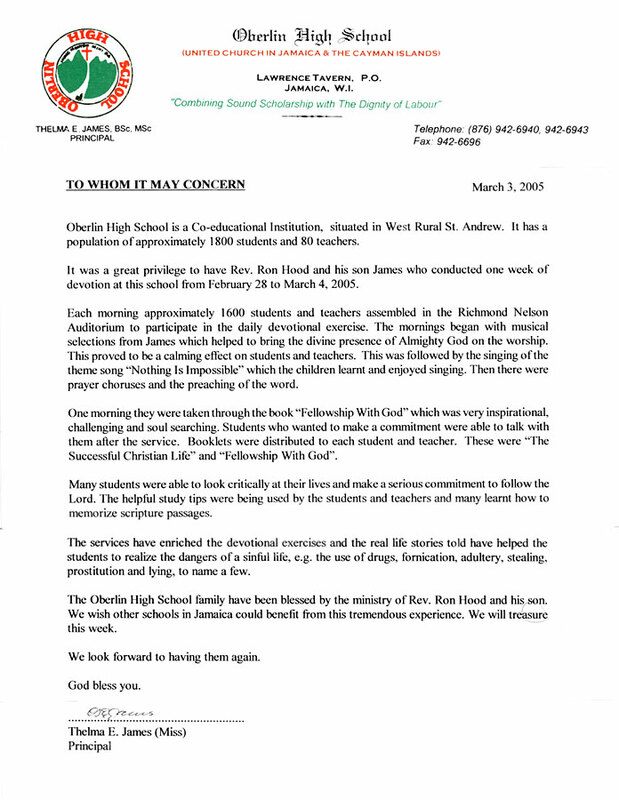 In some of the high schools in Jamaica we have challenged the students to memorize Scripture. In those schools, we gave each student a booklet that contains instructions on how to memorize and twenty verse cards. We have received quite a few letters from students, telling how the Scripture they have memorized is helping them. "Your verse pack has helped me with my Christian life, it has helped me to know my Bible better. I enjoyed your coming to my school (Guy’s Hill High). Thank you very much. Keep up the good work. God bless you." This book which you gave me, has helped me so much. It taught me how to memorize Scripture and also some rewards which can help in my daily life. It gives me great wisdom (Psalm 119:99, 130). These verses have helped me, and I still use them and I thank you for that book and I hope you and your family is having a wonderful day. May I say thanks for coming to my school, Charlemont High, in Jamaica to share the word of God with me and my friends. I truly appreciate it. I have started studying the verses in the little booklet you have given to us. A friend of mine who does not attend my school would like to have one of these little booklets to study. Since I have started memorizing these Scriptures it has helped me a lot in my relationship with God and the people around me. I love it very much so please keep up your good work. I am writing this letter to inform you that I have memorized all the verses on page 1-20 and quoted them to a friend. The name of the listener was by brother Jarren Murphy. It helped me to stop what I usually do (e.g. give my parents trouble). You have come to our school, which is Guy’s Hill High School, and you have lift our heart with the words you have told us. From that time until now, I still remember the words you have said. From Jonathan Ellis . . . I was saved as a young boy. I grew up in a Christian home, but I did not serve the Lord. In fact, I really did not believe. The Lord took me to the lowest point in my life before I opened my eyes. From rich to poor, from suburbia to a rescue mission—He took it all to open my eyes. I am born again. I struggle. Please pray for me. These lessons really do help my soul. I would like you to know that these Bible lessons came at the right time. They were the exact answers to some important questions I was pondering over. Just another way Jesus is answering my thoughts. "Seek and ye shall find." I found some peace with these lessons. They help me each and every day. From Thomas Baker. . . I wish the best for you. I also wish to thank you for taking the time out of your busy day to bring my certificate of completion of the course. The Lord has truly blessed. You see, I learned that when Jesus died, I died with him; and I know He died for my sins. Also I am in Him and He in me. Again thank you, and may God’s light always shine upon you. Bless you. In June ’98, we had a service at Shanet’s school. She enrolled in the Bible correspondence course at that time. After completing course one (seven lessons) she wrote this letter. "First I must greet you in the mighty name of Jesus. I am a student of Edith Dalton James high school who want to be in your club as long as long can be. I remember you when you came to my school to have devotion and so then I gave you my name and address and I just want for you to continue pray for me because I mean well in Jesus name. I got save on January 24, 1999 and baptize at Church of God of Prophecy. If it wasn’t for your words or lessons you taught me I would still be letting the devil control me. Thank you for your kind support." I have received your package with my certificate and I am very pleased about it. I am so glad that you have come to our school (Glenmuir High School); and if it weren’t for you and your family, I would not be learning so many things about God. Thank you very much for the picture brochure. I really appreciate it. The certificate was beautifully done. It is nice to know that you and your family really care in sharing the Word of God with me. I hope you will consider coming back to Jamaica because the students and I really learned a lot of Bible verses from you and your family. Continue to do the good job you are doing. God will continue to bless you and your family because you are doing his works. God bless you all. Testimony from a prisoner in the U.S.
We received a note from a prisoner in Michigan requesting his certificate for memorizing the verses in one of our verse booklets. Along with his certificate, we sent the first lesson of our Bible correspondence course and a picture brochure about our Jamaica ministry. About three weeks later, he sent the answer sheet from the first Bible lesson and an encouraging letter. He wrote, "Before, I could only remember some scripture but could not remember the book or chapter I read it in, and that can be kind of embarrassing when you’re trying to present the gospel to a lost soul. But now I can remember the book, chapter, and verse—thanks to your memory packet." Concerning the Bible lessons he wrote: "I thank you for your Bible correspondence course. It was very knowledgeable and enlightening. I would appreciate it if you would send me the next Bible lesson." He thoroughly enjoyed learning about the work God is doing in Jamaica, and He wrote, "It is my goal to be an Evangelist one day, and I have to let you know that you and your family inspire me. Glory to God." Greetings in Jesus’ holy name. I occasionally listen to your programme, and I am blessed by it. It has encouraged me to get a copy of your book, How To Memorize and Review Scripture, which I have obtained. To be honest, I did not know that memorizing Scripture could be so enjoyable. I praise Almighty God for that awakening. Now, I am even reading my Bible. I would like to obtain more copies of your booklet entitled "Fellowship with God." I am enclosing the card for free home Bible course. I am an avid listener of the Harbour Light of the Windwards, Carriacou. Needless to say I have been tremendously impressed with your inspirational preaching. Due to the fact that I am a recent born again believer and your teachings have served as a great anchor in strengthening me spiritually. I am writing this letter to ask if you would so kindly send me your book entitled, How To Successfully Memorize and Review Scripture. I am 19 years of age and hope that you would grant me this favour so that I may be able to continuously grow in faith and strength of the Lord. Thanking you sincerely.